The cold water normally comes into the house in blue MDPEMedium Density PolyEthelene. (the type of plastic used in water supply pipes etc.) plastic pipe and there is a stop tap either below the kitchen sink or in the basement/garage etc. The pipework then continues in 15mm. copper or push fit plastic and serves the kitchen and bathroom cold taps (and combi boiler if fitted) . If there are header tanks for a vented hot water system and/or a central heating then the rising main continues up into the attic to supply them. The hot water will normally come from a hot water cylinder (usually in 18mm pipework to the bath and 15mm to basin, bidet, shower etc.) or directly from a combination boiler (usually in 15mm pipework). Consider using a service duct to make pipework and future repairs and modifications easier. Each point of connection, such as basin, shower etc. should have an isolator valve so that if there is a fault or leak then each appliance or outlet can be turned off and isolated. Outlets may be required for any or all of the following: basin, bath, bidet, shower. The main electrical circuits to the bathroom are likely to be for lighting, shaver socket, heated towel rail and possibly extract fan and power. A useful circuit diagram for a typical house can be found in part P (page 16) of the Building RegulationsThese are the mass of regulations that cover safety, health, welfare, convenience, energy efficiency etc. in the way buildings are constructed. Not to be confused with Planning consent (which is more to do with whether you can put up the building in the first place). See more on the regulations . A bathroom is divided up into 3 notional safety zones explained below) which determine what types of electrical equipment is considered safe. This is all covered by BS7671 the ‘Requirements for Electrical Installations’ – Section 601. 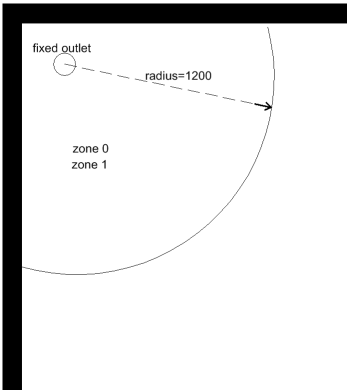 Zone 0 is actually within the fitting itself whereas zone one is immediately around it. 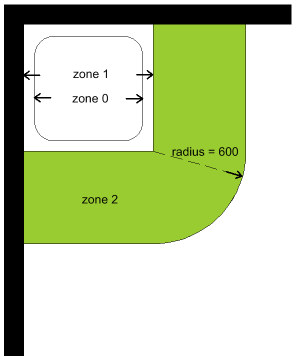 Zone 0 includes the area below a bath if it accessible without a tool. The zones which are away from the fittings (not shown green) used to be classified as zone three but this has now been done away with. The zone 2 around the basin is considered good practice rather than being mandatory. With wet rooms the configuration is slightly different: zone 0 and zone 1 are considered the same. 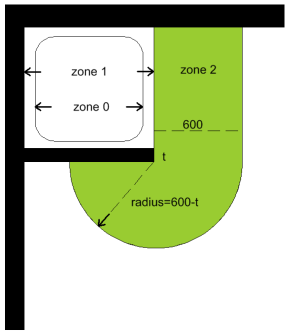 Zone 1 – the area directly above zone 0, limited to a height of 2.25m above the bath or shower. A minimum rating of IPX4(IP44) is required. In this zone, if there is likelihood of water jets being used for cleaning purposes, a minimum of IPX5 is required. 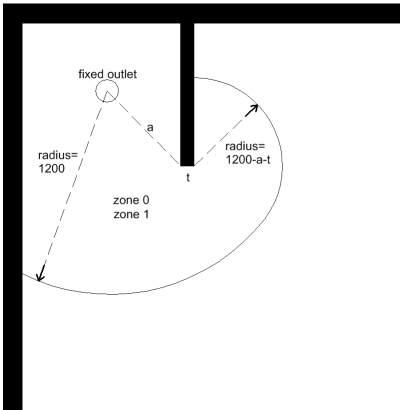 Also, subject to IP rating, SELV or 240V luminaires may be used in this zone; if the fitting is 240 volts, a 30mA (RCDResidual Current Device. This is a device which protects against electrocution.) must also be used to protect the circuit in this zone. Not Zoned (formerly Zone 3) – SELV and shaver outlets are allowed in this area but other portable electrical equipment is not. 6 – totally protected against dust. Underfloor heating is allowed in any zone but must be covered by an earthed metallic grid. Normally waste water from the bath, shower basin, bidet etc. 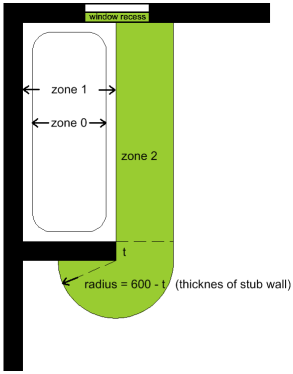 will first go through a trap (to prevent smelly air from the drains entering the room), then flow through waste pipes into a vertical 110mm soil stack (or maybe in the case of an existing house, directly out through an external wall into a hopper or gully. The diameters and lengths of pipes and gradients between the traps and the stack are important to get right and are given in the Building Regulations Approved DocumentsApproved documents (England) are detailed publications which come under the English Building Regulations. They are based on tried and tested methods of building and if you follow them you are assured of complying with the Regs. The equivalents for Scotland are the Technical Handbook, for Wales: the Approved documents (Wales), and for N.I. the Technical Booklets H1. There are devices on the market for extracting the heat from shower waste water in order to pre-heat its supply water. They are basically a sleeve around the waste pipe which acts as a heat exchanger. As the waste warm shower water flows out through the inner pipe it passes the cold incoming water and gives up its heat. Apart from saving energy it may enable a shower to give a decent flow of warm water when otherwise it could not. Many electric showers are rated around 9kW. (because their supply cable can usually be 6mm², depending on distance from the consumer unit etc). The larger ones (such as 10.5kW) will need a 10mm² cable (and probably a higher rated MCB). In cold weather when the incoming mains water is around 4ºC. the less powerful showers are normally struggling to provide a decent performance whereas when the supply water is pre-warmed they can be at least 25% more efficient. the copper shower supply pipe is coiled round the shower waste pipe and absorbs heat from the waste water. There needs to be a couple of metres drop below the outlet so the shower should be above ground floor. If you are considering treating the bathroom as a wet area (and there is often quite a strong argument to do so considering the amount of water that gets spilled on the floor around showers, baths and basins) then one of the best ways is to drain the whole floor to a point under or near the shower and coat it with fibreglass including a 100mm upstand all the way round the edge of the room. This way you can be sure nothing is going to leak through. If the floor is timber then the procedure is to lay an 18mm OSBOriented Strand Board floor (supported at all joints) and use firring pieces to create a slope towards the waste outlet. A slope of 5 mm per metre is adequate and can be achieved by forming a slight dishing effect of the floor by simply screwing the OSB firmly down to the joists without the need to cut it. Then lay chopped strand mat over the area and roll polyester resin on and allow to set. Include the flange of the waste trap to seal in the trap. Lightly sand down any protruding glass fibre and any bumps. Then recoat with resin (as the sanding down will have exposed fibre ends which can allow moisture through). You can then apply a finish such as ceramic tiles etc directly onto the GRPglass reinforced plastic, also commonly known as fibre glass.